The first time I heard it, I was sitting in the front seat my my parents’ car. My dad was driving, and my mom was in the back seat with Madeline. At that moment, no one was talking, and the radio was low. Suddenly, one of the cutest, funniest sounds I’d ever heard came from the back seat. My dad and I started cracking up, having no idea that my mom was assisting Maddie. The two of them kept us entertained for the rest of the drive, and when we jumped from the car we demanded to see her in action. As she got older, Maddie learned how to make the noise on her own. If you mimicked the sound, she’d start to make it. Every time we drove somewhere, I would mimic the sound if she got too quiet in the back seat. If she was awake, she’d immediately respond. But, my favorite times were when she’d decide to do it on her own, apropos of nothing. We could be sitting there quietly, snuggling or maybe flipping through the pages of a book. She’d turn and look up at me, get a smile on her face, slowly bring her arm up to her mouth, and then start making the noise. She got such a kick out of making us laugh. I always said she was destined to be a performer. When we hear it now, we smile wistfully. That is so cute! My kids have always loved doing this too. My youngest is now 16 months and still grabs my finger and pulls it to her mouth for make those noises! .-= Kate @ UpsideBackwards´s last blog ..Cute =-. .-= pamela´s last blog ..Secret Loooovers =-. The archives of videos you have will be awesome to show to Binky later on. I envy how many you have. Not that it will ever be enough to remember everything though. Ones of my kids at that age are scarce. Stay well. .-= habanerogal´s last blog ..Quitting Update =-. So adorable! She definitely loved to put a smile on your face, i bet she is looking at you both from heaven and making that noise right now! Oh, her sweet little face and her sweet little voice. How adorable. How totally funny. One of my babies when they were babies did it too. I wonder if it is a general babything. I had completely forgotten about this sound bit had to laugh so hard when I heard Madeline do it. She probably would have become a performer, she had all it takes! .-= catherine lucas´s last blog ..Cistercian Abbeys galore =-. I don’t have a single video of Matthew and it kills me. .-= Loralee´s last blog ..Veteran’s Day =-. OOHHH What a little sweetie. How loved she is!!! How loved you all are. Thanks for the memories…they are precious and priceless and such an incredible gift for you to share with the world. Sometimes….”thank you” just doesn’t see like enough!!! .-= Lynn from For Love or Funny´s last blog ..Very stupid-stitious =-. My heart absolutely breaks for you. Oh my goodness – the cuteness!! All of the photos, and the many videos, that you & Mike have of Maddie are absolutely priceless, and I can just imagine the giggles that will come out of Binky when you show them to her! She’s going to learn lots of precious things from her big sister! I love how her eyes widen when she makes the sound. Adorable! She is just to beautiful for words. A video so cute that would make anyone smile just made me cry and cry because the world is so unfair that such beautiful and wonderful little children have to leaves us so young. I wish I had such perfect memories of my first baby, my son Evan, he in all of his perfection died in labour and I never got to see him smile or open his eyes. I know how deeply the heart hurts without her, I can’t even imagine how much more a person can hurt then I do, but I think if I had had time to really know Evan, it would hurt just that much more, so it’s both a blessing and curse, and really I guess there is no right answer. Reguardless I the world is significantly worse off without Maddie in it. I know you will cherish these videos and pictures forever, they are so wonderful. Thank you for sharing. I love her sweet little voice! O Heather what a precious video of your darling girl. I had to watch it again and again, her special sound is indeed the sweetest sound. What a precious memory and thank you for sharing with your readers. Adorable! I’m sure Binky will love watching her big sister. Love it. That’s the best sound I’ve heard in a long time. .-= cindy w´s last blog ..Two =-. Alex was in LOVE with her laugh. Do you remember when I had to email you and tell you that it wasn’t an Uncle Pervy watching your You Tube video over and over, but Alex and I? Oh yeah, he had it BAD for her. .-= Aunt Becky´s last blog ..Today’s Post Is Brought To You By The Letter Random =-. What a precious sound! And from such a cutie pie too! .-= jen´s last blog ..play it again =-. That is the sweetest sound! And the sweetest little face. That is great. Love it and the cuteness radiates. Such a sweet video.. it brought such a big smile to my face! Her smile is infectious.. it goes all the way up to her beautiful eyes! Adorable, simply adorable! My daughter also does this and it is the sweetest sound! I love that she gets louder towards the end of the video! Hope you are doing well today. This is just too adorable. I love watching her whole face light up as she realizes she can make the funny noises! My 17-month-old son (15 mos adjusted) is sitting on my lap while I watch Maddie. And now HE’S doing it. . . it was kind of bittersweet, hearing her and hearing him too. My heart cried for you. .-= Becky´s last blog ..Some Evidence that Watching TV Makes You Stupid =-. So cute!! I love how many videos and pictures you have of Maddie. It’s made me realize that I need to take more of my kids all the time. .-= Lisa´s last blog ..Happy Birthday Maddie =-. .-= kbreints´s last blog ..A kid with standards… =-. Oh, she’s so cute. She sounds like Donald Duck! Thinking about you guys a lot this week. Have a restful weekend. Really cute and nice video. My Daughter will be surprised once seen this. i will show her your video and blog post. .-= Latest News Blog´s last blog ..Main 9/11 Suspects to be Tried in New York Court =-. Oh my goodness! The cuteness just keeps coming. I have seen so many pictures and videos of your sweet Maddie, but never this one. Thank you for continually sharing her with us! Love those big baby blues! .-= Jenn´s last blog ..The sweetest surprise =-. .-= Angie [A Whole Lot of Nothing]´s last blog ..I’m completely lucky to get the new HP Fancy Pants printer =-. This is so sweet. Libby and I watched it and then when it was over, she started doing it. So, I turned it back on for her and again, she was completely enthralled with it. I love you and Miss Maddie Heather. .-= Kim´s last blog ..For Maddie =-. So cute and funny. I know you will never feel as if you have enough, but it’s wonderful that you have so many pictures and videos of the wonderful Maddie. That brought such a smile to my face today. Thank you for sharing that! .-= Binkytowne´s last blog ..Magic Red Syrup Do Your Thing =-. Oh my gosh, what a cutie pie — how funny! You’re right, that’s the sweetest sound. Aww my boys all loved to do that too. Thank you for sharing this. on a side note: I was watching this with my sick 4 yo on my lap, with tears in my eyes snuggling him close. When he farted. Not just a little kid toot, but a blinding eye watering fart. Ahh kids. .-= Jenni/mom2nji´s last blog ..Progress =-. Always such a sweet, happy girl. And those striking eyes! .-= Heidi´s last blog ..Single White Male =-. SO CUTE. I love her. .-= AMomTwoBoys´s last blog ..On Your Birthday =-. PS I love you and Mike too! And Binky. And Rigby. Sweet little baby sounds are the most beautiful sounds around. .-= Rebecca´s last blog ..En Loco Parentis =-. .-= Michelle Pixie´s last blog ..The Headache Of Sharing =-. That is awesome! Very cute. I am so glad, as I’m sure you are too, that you have so many videos of Maddie. It will be great showing them to Binky when you tell her about her wonderful sister Madeline. She truly takes my breath away sometimes. Possibly the happiest little face I have ever seen. What a sweetie pie!!! Still bringing laughs and smiles to soooooooo many people. What an amazing little angel. Oh, the cute! Maddie knew full well how to bring the cute. What an amazing little girl. You guys are an amazing family. .-= Alison´s last blog ..For Maddie =-. Maddie always finds a way to brighten my days. I needed that smile today. One of the things that is most apparent to me is that you treasured your dear Maddie even in life, not just in death. What an amazing testament….it’s so obvious that you enjoyed her so much, I love to see it. Even though she had a rough time health wise at times, could a life be filled with any more love and happiness? Way too short but happy indeed. SOOOOOOOOOOO true!!! Heather and Mike, you did not take Maddie granted for one second, and you cherished every moment, every smile, every giggle. Those 17 months were filled with joy for everyone that knew her. Maddie knew what she was doing when she picked you two as her parents!!! .-= Jen L.´s last blog ..It’s Official =-. I cultivated this sound in my son because it is one of my favorite sounds from a baby. Then later, when he learned to do it on his own, he would use almost anything OTHER than his finger to make the sound. I’ve caught him using his foot, a toy, even a bottle to make it. It is, indeed, the sweetest sound. Too cute. That made me smile. That almost made me cry, but almost all of your posts since April do. She is the sweetest thang (next to my boys of course) that I’ve ever seen! I need to take more videos of my kids….. I’m going to make a pact with myself on this… everyday I need a video of them! .-= Amanda (Garibay Soup)´s last blog ..Tonight My Heart is Heavy =-. oh, le sigh…she’s so sweet! .-= Mishi´s last blog ..Photographer for Hire =-. I am an avid reader of your blog, though I rarely comment. Tonight when I stepped out of work, I looked up and noticed that the Empire State Building was lit a beautiful purple. I thought it only fitting as your Maddy’s birthday was this week. Happy Birthday from NYC! So sweet!! I remember the first time we did that with JonJon. He would get this big ole smile on his face and just giggle!! So precious!! She is definately a star! .-= Noelle´s last blog ..My new gig: bambini spotlight =-. 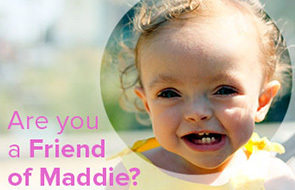 I always stumble upon your blog inadvertently and you always show me how wonderful and gorgeous Maddie is. I love it when adults “help” babies make those adorable noises! I’m sure you used to put the palm of your hands on her mouth back and forth so she sounded like “wa-wa-wa-wa”, I used to do that to my daughter when she was little. So sweet and precious. Thank you so much for sharing your gorgeous daughter with all of us. I love seeing her picture and watching the small videos. I’m caught up now after being away for a bit so you have successfully put my emotions through the ringer and amazed by your immense love and my son loved Maddie’s video and smiled ear to ear and asked for it again and for more pictures and videos of the amazing Maddie. Its Saturday afternoon and the England rugby team are playing against Argentina – I thought you and Mike would be interested to know that the rugby team are wearing purple rugby shirts. Its the first time we’ve seen them in purple and we immediatley thought of your precious World Famous Maddie. What an appropriate colour for our team to be wearing. Thinking of you lovely lady. I’m new. Someone led me to this sight to show me an adorable video of a beautiful little girl. My beautiful Solana who will be four months old tomorrow was sleeping in her crib. I had to cover my mouth from laughing so hard because it was just so darn adorable, and I wondered, Can Sol do that? Then I kept reading, and I cried. As a new mother, I cried for your loss, I cried for your husband, and for everyone who love this beautiful angel. I wasn’t expecting to read what I wrote, and I truely want to thank you, because 20 minutes before, I was talking to to by husband on the phone complaining that I really hope she sleeps tonight. I thank you because after reading your blog, I’m reminded to not sweat the small stuff. And to enjoy each moment, even if they happen at 4am. Sol will wear purple tomorrow in honour of Maddie. My prayers are with you and your family to continue to possess this unbelievable strength. You are an inspiration. I watched and smiled at that video as if she was my own child. Funny, but she has sort of become everyone’s little girl. We all embrace her, we all mourn for the little girl with the bright eyes. What a beautiful tribute to a beautiful and much loved little girl. She continues to shine all over the world. I am listening to her laugh in France. .-= Mrs. Schmitty´s last blog ..They Worked Hard For The Money =-. That video of Maddie made me smile and cry. Nolan makes the same noises. Again Heather, she was so gorgeous. ive been having the most godawful night, and this video made me smile (and laugh) through my tears. .-= Sara @heartmychloe´s last blog ..I’ve got a case of the yuckies =( =-. .-= Two Makes Four´s last blog ..We Are One =-. You posted this a week ago and it’s been echoing in my head ever since. It’s just precious, and I love the image of your mom and Maddie doing this in the back of the car. Hugs and kisses. .-= Megan´s last blog ..Hospitalization: One Year Later =-.